French version (1st edition) sold out, only collector available. In early 2012, an old analog photobooth was installed in Brussels, in a cultural center located near the home of Thomas Vanden Driessche, documentary photographer and member of the group Out Of Focus. Following in the footsteps of artists like Topor, he decided to use this medium and its constraints to tell stories about the little world of photography he knows so well, through these strips of 4 pictures. 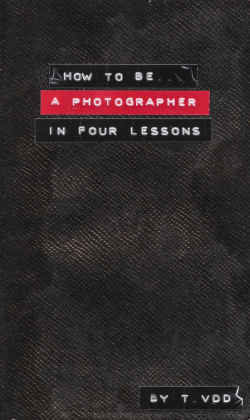 These “lessons” were basically distributed weekly through the Internet, but soon began to form of a real little guide to Contemporary Photography (How to be a contemporary, kitsch, conceptual, war, school of Helskinki photographer, etc.). 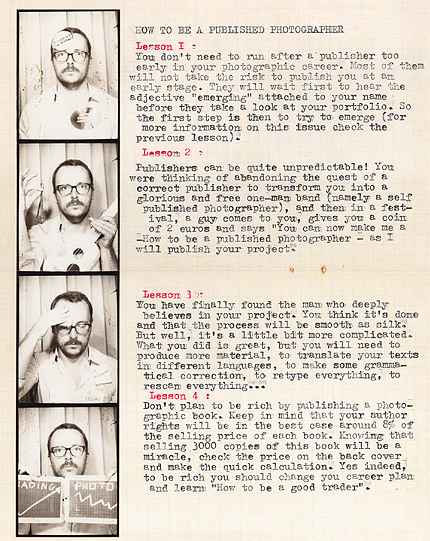 Armed with his Valentine typewriter, Thomas gives his lessons with a very personal humor and a gentle irony, highlighting stereotypes and excesses of some contemporary photographic trends. The author, personally embracing many influences from the mainstream of documentary photography in his own work is not sparing himself and also questions, in a way, his own approach.